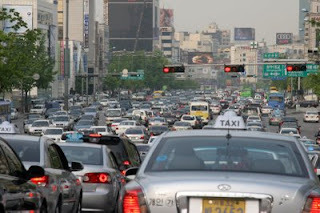 Will's Korean Journey: An Idiots Guide To Driving In Korea. An Idiots Guide To Driving In Korea. 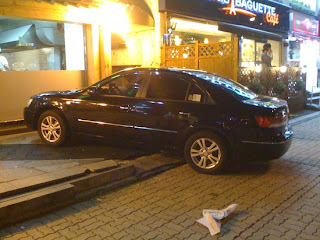 For those of you who do not know, I have started driving on a regular basis here in Korea. Thanks to Brenden leaving I found myself in position to learn how, and become competent on a motorcycle. I know have a way to get around town when I need to, and every now and then leave the town for one of the smaller localities around. Yet, with these new experiences I feel compelled to create a guide on how to drive in Korea for those of you who may one day consider trying it. Rule Number One: There are no rules. Now this is not to say that there aren't rules to the road here in Korea, it just means that they are primarily considered suggestions. Rule Number Two: Red still means stop, unless you can make through the intersection up to and including one minute past the red light. Rule Number Three: Green still means go, unless the intersection is blocked, in which case it means play car Twister. 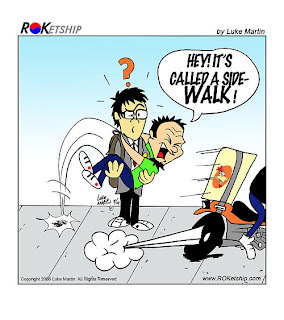 Rule Number Four: Sidewalks are for the following uses only: Pedestrians, Bicycles, Motorcycles, Scooters, Walking, and Parking your vehicle. Rule Number Five: You can stop your vehicle to offload or upload any person or item on any road provided you put on your emergency blinkers and are in the right lane. You can have an added bonus if you block an intersection while doing this. Rule Number Five: Don't screw with the delivery boys. These guys are whipping around traffic without protective gear at high speeds on their scooters. Watch out, just because your vehicle outweighs them and has the green light, doesn't mean you have the right of way. Rule Number Six: If you drive a Motorcycle or Scooter you are allowed to use Crosswalks to get around a red light. Rule Number Seven: Parking on the street is fine. On any street, in any direction parking is fine. You can even park on both sides of a narrow street effectively making it a one lane alley. It's still two way traffic. Rule Number Eight: There is no problem with double parking, or blocking somebody in. Just leave your hazards on and the keys in the ignition. Rule Number Nine: It is acceptable to move someone's vehicle if they have left the keys in the ignition so that you can park your vehicle . You don't even need to ask them. Rule Number Ten: Seat belts are optional unless the cops find you. Seat belts are always optional in the back seat, regardless of the police seeing you. Rule Number Eleven: It is okay to put two people in the front passenger seat provided the seat belt fits around them. Rule Number Twelve: There is absolutely zero tolerance for Driving Under the Influence. However I have yet to run across any DUI check points. Rule Number Thirteen: Just leave your car running. When you run in to use the bathroom, or do some quick shopping, just leave your car running. It may be hot or cold outside so you need to keep running your heater or air conditioning. Bonus points for taking a nap and running the air conditioner with your windows down. Rule Number Fourteen: There are no stop signs or yields. When you arrive at an intersection that does not have a light, whoever goes first goes first. 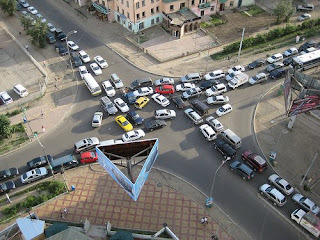 There is some consideration for flow of traffic, but if not you just go anyways. Rule Number Fifteen: You can cross any road at any time so long as you hold up one hand and start walking. Rule Number Sixteen: Remember what the speed limit is at all times. That way when you come across the speed cameras you can figure out what 11% above the speed limit is and slow to that speed. Rule Number Seventeen: There is no speed limit unless you are coming up on a speed camera. Rule Number Eighteen: Police don't do anything. Run a red light, speed, or cut someone off. The police don't do a thing. In fact they tend to do most these things. Rule Number Nineteen: Always remember that it is ok to turn right at a stop light, even when people are turning left into those lanes. You don't even have to stop. Rule Number Twenty: No Harm, No Foul. As long as there was no harm, there was no foul. 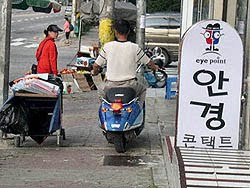 Rule Number Twenty One: If you hit a pedestrian just pay them 1,000,000 Won and all problems are solved. Rule Number Twenty Two: There are no rules about protective wear for motorcycles or scooters. Don't wear a helmet, that's fine. 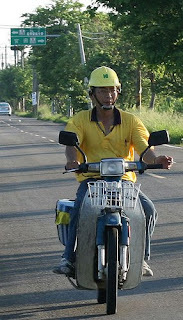 Want to wear a helmet but can't afford one? Just wear a construction hard hat. Can't find a hard hat? Just wear a bucket. Rule Number Twenty Three: When in a traffic jam, watch for the vendors selling snacks and drinks standing in the lanes. Some of these vendors are selling alcohol and it makes a long stop in traffic fun. Rule Number Twenty Four: There are no rules against open containers in a car. Drink all you want in the vehicle, unless you're the driver. Rule Number Twenty Five: Drinking on public transportation is fine. Karaoke on public transportation is even better. Rule Number Twenty Six: There are no rules, just drive. I hope that these rules have been effective in helping calm and allieviate any fears you may be having about driving in this wonderful country. Oh gosh. I miss getting donuts at Paris Baguette. I had a motor scooter in Seosan. I miss crosswalks to get around red lights.